With Easter coming up, this is the perfect time to make cute desserts with your kids! 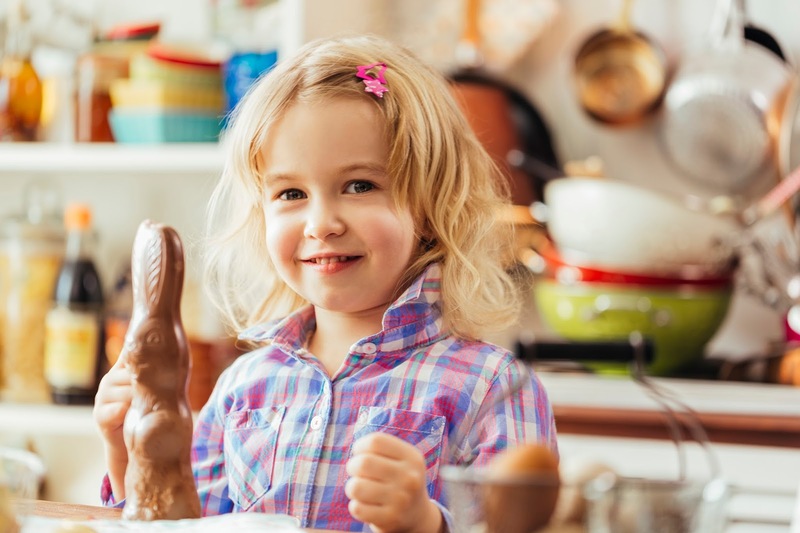 Whether you’re hosting family for Easter dinner or are simply looking for a fun activity to occupy the kids on a rainy day, these recipes are easy enough for little hands and super delicious! Don’t forget to stock up on all the ingredients and Easter-themed molds that you’ll need at Sweet Treat Supply. Lay out a large piece of parchment paper. Put 8 ounces of semisweet chocolate chips and 8 ounces of milk chocolate chips in a microwavable bowl. Melt the chocolate chips, but be careful not to overheat the chocolate. Spread the melted chocolate onto the parchment paper into a rectangle (the size depends on how thick you’d like the bark to be; we’d suggest keeping it pretty thin). In a microwavable bowl, melt the pink candy melts. Be careful not to overheat the candy melts. Pour the melted candy melts on top of the chocolate. Using a knife or stick, swirl the candy melts into the chocolate (try back and forth, up and down, or in spirals). Place the candy and cookies on the melted chocolate and candy melts. Press down lightly. Allow the Easter Candy Bark to dry for at least three hours. Break into pieces and enjoy! Credit for this recipe comes from Love from the Oven, and the recipe is totally customizable. Let your kids express themselves through treats! Prepare your candy melts or chocolate according to the package instructions. Color your coconut into grass: Add two drops of green food coloring to a plastic container, add the coconut, seal and shake well. Spoon a coating of candy melt or chocolate on top of your Rice Krispies Treat. Press a Peep into the candy/chocolate. Add sprinkles or coconut around your Peep. If you selected a chick Peep, add a few Robin’s Eggs candies. Add a sucker stick to the bottom of your treat. There you have it! Easy, quick and fun, not to mention perfect to display on a table along with other Easter goodies. Lay the Swiss rolls on a flat surface. Pour your vanilla frosting into a pastry bag. Press all air out and snip off end. Cut a shallow V-shape on the bottom of your Peep so it sits flat on the cake roll. Add a small amount of frosting to the bottom of your Peep, then place toward the back of the cake roll.